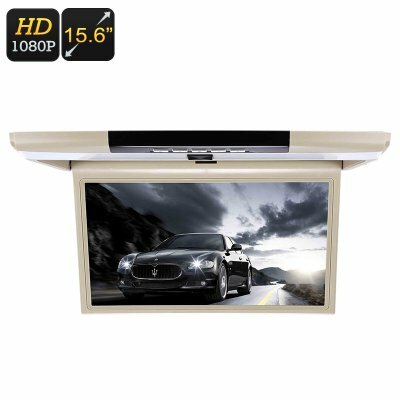 Successfully Added 15.6-Inch Roof Monitor - 2x Speaker, 32GB SD Card Slot, 32GB USB Port, 1080p FHD, Remote Control, FM Transmitter to your Shopping Cart. This 15.6-Inch roof monitor ensures that your passengers will never feel bored again during your upcoming road trips. It supports Full-HD 1080p resolution. Thanks to this it brings along a true cinematic experience anytime you turn on its TFT LCD display. You’ll be able to watch movies and series or listen to your favorite music. Nothing is too much for this car entertainment system. Due to its large display, this car media player is perfect for larger model cars, vans, and busses. The roof monitor features two intergraded 1W speakers. You will always be able to enjoy great audio while watching your films or listening to music. Additionally, it has an FM transmitter. With this feature, you’ll be able to play the sound straight through your car’s stereo. For those of you that wish not to disturb the driver, this roof monitor also works fine with your wireless headphones. Its 15.6-Inch Full-HD display can be tilted at an angle of 45-degrees. This allows you to create the perfect viewing angle for yourself and enjoy your media to its absolute most. Storage space also is something you won’t have to worry about. This roof monitor supports a 32GB SD card slot and a 32GB USB input. With all this external memory support at hand, you can bring along hours’ worth of fun during your trip. Adjustable brightness and color will further enhance the experience of your passengers. From now on, everybody in your car will be able to enjoy films and series in sharp detail and vivid color. To bring along great comfort, this roof monitor has its own IR remote control. With this little gadget, your passengers will be able to effortlessly make use of all this car media player has to offer. This roof monitor is the ultimate way for you to pimp up your ride and entertain your friends. The gadget will make sure that there’ll never be a moment of boredom in your vehicle again. Arabic: - سيارة ميديا بلاير - Chinese Simplified: - 汽车媒体播放器 - Czech: - Auto Media Player - Danish: - Bil Media Player - Dutch: - De speler van de Media van de auto - French: - Voiture Media Player - German: - Auto-Media-Player - Hebrew: - נגן מדיה לרכב - Hindi: - कार मीडिया प्लेयर - Italian: - Auto Media Player - Japanese: - 車のメディアプレイヤー - Korean: - 자동차 미디어 플레이어 - Malay: - Kereta Media Player - Norwegian Bokmål: - Bilen medieavspiller - Romanian: - Auto Media Player - Russian: - Автомобильный медиа-плеер - Spanish: - Reproductor de medios - Thai: - รถเครื่องเล่นสื่อ - Turkish: - Araba kitle iletişim araçları oyuncu - Vietnamese: - Máy nghe nhạc phương tiện truyền thông xe.